I wanted to get this up yesterday in honor of Dr. Seuss’s birthday, but I’m a day late and a dollar short. Yeah, that’s totally how I roll. 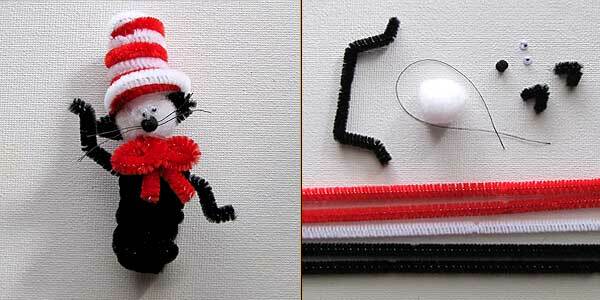 But I figure you all would love this Dr. Seuss craft as much as I do, so I’m putting it up anyway! Even my teenage daughter loved them – as did my dog, who promptly chewed them all up. Pfffttt. 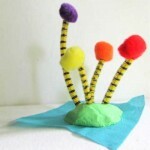 It explains how to wind the pipe cleaners around your finger and how to attach the pom poms accurately. 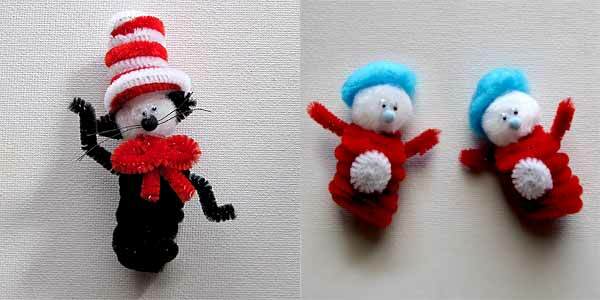 For the Cat in the Hat, you’ll need 2 red pipe cleaners, one white, and two black (the black used together to make the finger puppet base). Plus a 4 inch black piece bent as shown to make the arms. First, wind the puppet base with the two black pipe cleaners. First you’ll wind a red and white pipe cleaner around your finger to make the top, then after three turns, start winding them together to make the brim. The wire is so easy to work with and so forgiving, don’t worry if it seems to come out all wonky – it’s super easy to fix into whatever shape you want. To make the top of the hat, simply coil the top pipe cleaner piece a little smaller as shown in the last photo in the series above. Glue the hat to the white pom pom. Bend two small black pieces of pipe cleaner as shown for ears, and glue them to the sides of the head just below the hat. Cut the thread into two 1 1/2 inch pieces, and glue them to the back of the tiny black nose pom pom. This is a little tricky because both are so small – younger children might need help with this part. Glue the nose to the middle of the front of the cat face. Glue the googly eyes right above the nose. Glue the head to the puppet base. Slide the cat’s arms in between the coils of the puppet base body. Tie a ‘bow’ with a red pipe cleaner around the neck, and use your wire cutters to trim the extra length of the ends off. 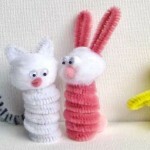 The materials shown will make both of these puppets – 4 red pipe cleaners plus two sets of arms bent as shown, two 2 inch pieces of white pipe cleaners, two white pom poms, one turquoise pom pom, 4 googly eyes, two tiny light blue pom poms. 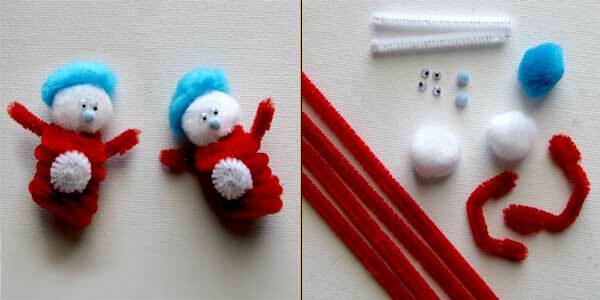 Wind the puppet base with two red pipe cleaners coiled together. Pull them apart very carefully so that the two sides stay intact. 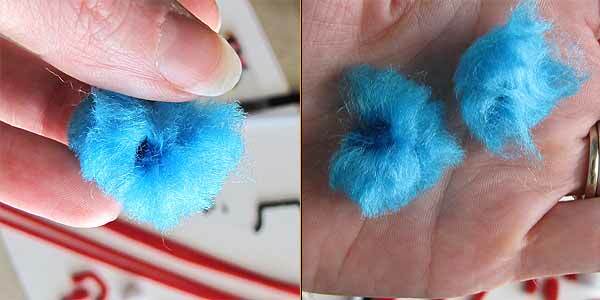 Quickly put a LOT of glue onto the blue hair and get it on top of the white pom pom head – otherwise the fuzzies will fly everywhere and make your nose itch. Glue the nose onto the face and the googly eyes on top of the nose. Slide the arms in between the coils of the puppet base body. Glue the head to the puppet body. Those are so cute! 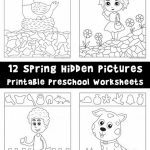 🙂 Love your little finger puppets! 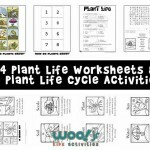 I had to feature this little darlings at Kids Create. Love this idea!! Thanks for the great idea! 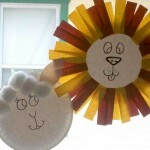 We made these today… you can see some of them at http://piseco.homeschooljournal.net/2011/03/02/oobleck-and-thing-puppets/. 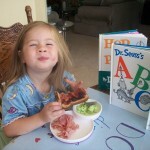 Pingback: Happy Birthday Dr. Seuss!